With Pioneer now offering aftermarket CarPlay support through their existing NEX displays, I got the chance to finally test drive CarPlay (without having to buy a new car) and see how Apple’s driving-optimized iPhone experience performs on the road. Apple describes CarPlay as “a smarter, safer way to use your iPhone in the car” because tasks like making phone calls, sending messages, finding directions, and playing music from your iPhone are completed using Siri and the car’s touch screen rather than fiddling with your phone in your hand. In short, CarPlay has a lot of promise and already makes a few things easier, but it’s not without its hiccups just yet. I’ll share my hands-on experience with upgrading to CarPlay with an aftermarket Pioneer display including a few interesting tidbits and lots of photos below. Apple’s CarPlay feature is primarily targeted at being available on certain new cars coming out this year and in the future by integrating with existing built-in displays, but certain aftermarket displays from Pioneer (and eventually Alpine) allow you to add CarPlay to your existing car, truck, SUV, or whatever you already drive. For my experience, I used CarPlay from an iPhone 6 128GB AT&T with iOS 8.1 beta as well as an iPhone 6 128GB AT&T with iOS 8.0.2 on a Pioneer NEX5000. After purchasing the aftermarket display, Best Buy’s Geek Squad installed the hardware including the display, microphone, GPS antenna, and USB line in my car. The whole process took about 4 hours, and the installation ran just over $99. Once installed and updated, CarPlay appears as an app. You’ll also need a copy of the firmware update (1.06) that adds CarPlay functionality. This process is wonky and very un-Apple, but it is an aftermarket display after all. Updating the firmware to get CarPlay. Not a very Apple UI. Display is a fingerprint magnet. Download the firmware update here, save to a FAT32-formatted flash drive or micro SD card (2GB or higher). 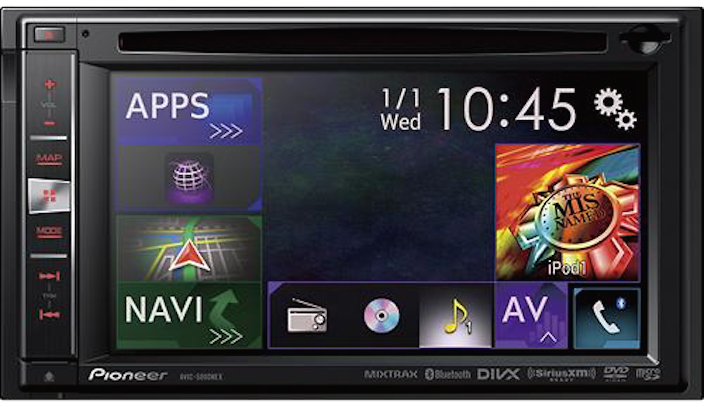 Once your display is installed, insert the micro SD card or connect the flash drive to USB1 and navigate to the firmware update settings in the Pioneer menu. Mine went from 1.01 to 1.06 taking about 5 minutes. Once you’re up and running with CarPlay installed, your iPhone connects to the display over the Lightning cable. My installer wired the USB extension cable to my center console (a nice touch especially compared to the glove box) and I’m using Apple’s 0.5m Lightning cable to minimize cord length. When you connect your iPhone and unlock it, a screen with a CarPlay logo appears briefly then goes away; I expected this screen to be persistent disabling use of your phone except through CarPlay, but you can actually continue to use your phone like normal when using CarPlay. Apple’s microsite for CarPlay runs through the list of compatible first-party and third-party apps that support CarPlay: Phone, Music, Maps, Messages, and Podcasts as well as Beats Music, iHeartRadio, MLB.com At Bat, Spotify, Stitcher, and CBS Radio News. Although it’s not an app, Siri is also front-and-center throughout CarPlay and enters a driving mode when connected. This means not every task you can do with Siri is available (like making reservations with OpenTable or looking up Wikipedia articles), but other tasks understand immediately that you can’t see your iPhone display and persistently read back text to you (like setting reminders and sending emails). Tapping the Phone app from CarPlay immediately prompts Siri to ask which contact you would like to reach, but you can tap a button to proceed past Siri and into the driving-optimized version of the Phone app. Below you can see various views within the CarPlay Phone app including a full-blown keypad for dialing numbers manually. You can also scroll through your contacts or search by alphabet for specific ones, but you won’t find a keyboard anywhere. During a call, you can return to your home screen by pressing the virtual home button on the bottom left corner. This means, for instance, you can take a call and view directions using Maps. If you do leave the Phone app during a call, a persistent icon appears in the top left corner for quickly returning to your call (and the tap target extends well below the small icon toward the clock). The Phone experience on CarPlay is one of its best features. Music control and playback on CarPlay has a great look with a night-friendly UI and large tap targets for easy access. It’s the same full-functioning Music app from your iPhone, only presented differently for the built-in display in your car. This means you have access to all the songs from your iPhone including playlists and iTunes Radio. You can even create iTunes Radio stations on-the-go using existing songs in your music library just like on your iPhone. Searching through a large library of music can be slow, though, as scrolling one page view at a time feels like a lot of work. Tapping the alphabet search button prompts you to search by letter, but even that can feel like a roundabout way of finding the right music. Siri voice control is probably faster than any touch method of navigating through your music, but the large controls are very nice on the Now Playing screen which includes a lot of functionality like creating a Genius Playlist or iTunes Radio station that you might not expect in a car system. iTunes Radio is very nice on CarPlay as well. I don’t use the service as much directly on my iPhone or from my Mac when it’s much easier to decide on something to play, but the tap-and-play functionality is very nice for the car, especially with the optimized user interface. Maps is one of the core features of CarPlay as driving is one of the most critical times for using navigation. CarPlay Maps offers a few benefits over other options: your car navigation system now has access to your contacts database with addresses readily available, your bookmarks and search history from Maps is with you all the time, and the user interface is very familiar with iPhone users. CarPlay Maps only uses Apple Maps, though, which is something you might expect, but it can be a very limiting factor in practice. Personally, I use Apple Maps all the time for looking up business information and referencing directions. I even use Apple Maps for navigation during trips most of the time and the CarPlay Maps user interface is terrific for iPhone users. The problem is what Apple Maps doesn’t do. CarPlay is built for the road, but Apple Maps isn’t the best GPS just yet. Apple Maps doesn’t yet offer useful options for traveling that other competitors have like lane guidance (which can be especially useful when traveling in a large city or unfamiliar area) and ways to avoid tolls (maybe Apple Pay will be prominent enough one day, but for now getting caught at a toll booth without cash is a real inconvenience). It’s not just the lack of navigation-specific features. While testing CarPlay for review, I traveled to an area in New Orleans that I’m fairly familiar with using Apple Maps over CarPlay. While the directions ultimately got me where I was headed, it wasn’t the most efficient route and, in fact, it was roundabout enough to actually be dangerous (especially without lane guidance). I only make this point because during recent trips to New Orleans I’ve given in and relied on Google Maps for navigation around the city despite giving up Siri controls integration with my address book. As reluctant as I am to use a third-party mapping app on my iPhone when it has a built-in option, I do feel safer traveling in an unfamiliar place with Google’s navigation as much as it pains me to say. While I don’t expect Apple to open CarPlay to third-party maps and navigation apps, I do have to give it a ding for reliability. As for using Maps over CarPlay, it does provide a very nice and simple interface which iPhones users will find familiar. It’s one of the only places you will find a keyboard on CarPlay (prompted when searching locations). I was surprised it was even available then as so much of the system relies on voice input through Siri. The persistent return-to-Maps icon will appear on the home screen during navigation just like a phone call. Like Phone, messaging while in the car is also greatly improved with CarPlay. Tapping the Messages icon will prompt Siri to read your new messages to you without having to ask. Siri will ask you which contact and what you would like to say to that person if you don’t have any new messages. You can tap a button to skip Siri, however, which presents you with a list of contacts you recently messaged. Tapping a specific name will either read messages from that person to you, or prompt you to dictate a new message to that person; you will never see an actual message thread on CarPlay making it less distracting and safer for the road. CarPlay Messages can’t handle attachments like photos and videos, though, so replying to them isn’t very practical. A new feature in iOS 8 involving attachments could be handled much better by both Siri and CarPlay, though: voice messages. Voice messages is a natural fit for CarPlay as the feature doesn’t rely on artificial intelligence to turn voice to text and text to voice. Instead, the sound can just be captured, shared, and played back. Hopefully future versions of iOS, Siri, and CarPlay take advantage of this space. New notifications appear throughout the CarPlay interface as a popup banner, similar to the iPhone experience, although you can’t dismiss them by swiping. The banners are wide and can be obtrusive, but they dismiss after a few seconds. Tapping a notification for a new message, for instance, prompts Siri to read you the content and ask for a reply. It’s a very fast experience as Siri is much smarter at getting the job done without asking too many questions. In addition to Phone, Music, Maps, and Messages, CarPlay users will see a Now Playing app. This serves as a shortcut for accessing the playback controls on the most recently used media player. This could be Music, Podcasts, or another music or media playback app on CarPlay. CarPlay also has an app for quickly returning to the non-CarPlay system interface from the automaker or display maker. For example, my version of CarPlay featured a Pioneer NEX icon which brought me back to the clearly-not-Apple user interface that you get when you’re not in CarPlay mode. Other instances of CarPlay may see icons for the automaker like Ferrari, Ford, or Hyundai. iOS 8 users will always see a Podcasts app on CarPlay which allows easy podcast playback similar to the Music app. iOS 7 users may not see Podcasts unless the app is installed from the App Store (it’s now built-in to iOS 8). I’m a frequent podcast listener and tried switching from Instacast to Apple’s Podcasts app for the sake of CarPlay, but it’s just not for me. Hopefully Apple adds support for additional podcast players in the future as it’s not nearly as difficult as allowing a third-party navigation app (and Stitcher is already listed as supported). Spotify is also supported by CarPlay if you have it installed on your iPhone. The app disappears from CarPlay the moment you uninstall it (like the Podcasts app for iOS 7 users. Unfortunately, the other CarPlay-compatible apps listed by Apple just aren’t ready yet. This includes the Apple-owned Beats Music streaming service, which both greatly surprised and disappointed me as support is somewhat advertised but simply missing without a timeline for support. In the meantime, you can use other media and navigation apps with the Pioneer display and use CarPlay for the Phone and Messages functionality. For example, you can playback Beats Music or voice navigation on Google Maps from your iPhone over the Lightning connection through your system and still see the CarPlay interface with access to Siri and the other benefits it offers. This hybrid experience is the compromise approach I’ll take to continue to use Google Maps and Instacast while having the benefits of CarPlay for Phone, Messages, and Music as well as Siri. CarPlay isn’t without its own issues not related to missing apps or functionality. Your mileage may vary from display to display, but visibility in direct sunlight was especially low as the CarPlay interface seems optimized for night driving. Visibility wise, CarPlay is a champ in cloudy conditions or through the night, but referencing the screen in direct sunlight can be more distracting than helpful sometimes. My display was also a magnet for fingerprints and I have clean hands. CarPlay can also be sluggish at times. Tapping an icon to launch a function could sometimes result in 5 or 6 second delays, which isn’t long once it works, but seems like ages while you’re waiting and not knowing if a touch was received. The search keyboard in Maps also consistently launched shrunk and misplaced. Tapping a key would immediately fix the issue, but the bug was persistent nevertheless. I also ran into an issue using iTunes Radio (no, it wasn’t the same song playing over and over). iTunes Radio features the ability to pause a station on one device and pick up playback on another device using the same account, and the time between playback can even be days or weeks. It’s a nice touch although it’s a prompt you have to first address, and CarPlay doesn’t seem to know how to address it. When first launching several existing stations, the alert would result in the station becoming entirely unplayable until the modal prompt was addressed on my iPhone. Scrolling is also a lot of work when using CarPlay. Pages are revealed one view at a time, but the Pioneer display features a toggle for making scrolling much quicker and smoother. Enabling this toggle does not extend to CarPlay, though, which is probably intentional but would improve the experience greatly. CarPlay will benefit from future iOS updates to iPhone as the feature relies on the device for functionality, but unfortunately there’s still some speed bumps that early adopters won’t be able to avoid. Aside from missing apps like Beats Music and wonky scrolling by design, there are a few interesting tidbits of information I learned about how the iPhone reacts when using CarPlay. First, CarPlay is unavailable to anyone using a locked iPhone. The display will prompt you to unlock the device before continuing to CarPlay. This is great for security reasons and I didn’t find my iPhone locking itself anytime during use. Even if you turn off your iPhone display, it won’t prompt for a passcode in CarPlay mode after the first time unless you disconnect your iPhone. Next, CarPlay really is an extension of using your iPhone. If you hold your iPhone and prompt Siri, then Siri will activate on your display. If you close an app, CarPlay will return to the home screen too. If you launch Maps, Maps will launch on your built-in display. This extension experience goes as far as taking screenshots. Each screenshot used in this review was captured directly from my iPhone. You get a screenshot of your iPhone display and a screenshot of your car’s display both saved to your iPhone Photos app. The Pioneer NEX5000 display resolution is 800 x 480, and screenshots of CarPlay captured by my iPhone measured in at 902 x 472 pixels. Finally, a single preference appeared in the Pioneer system settings for CarPlay: driver position. This allows you to move the clock and home button bar from the left of the display to the right of the display for drivers in countries where the position differs. The rest of the interface, however, remains the same including app icon placement. Is CarPlay ready for the road? Unless you’re already buying a new car or have one of the existing aftermarket displays, the expense of upgrading your system for CarPlay alone is still a high cost. I’m a huge fan of the way CarPlay handles Phone and Messages and the Now Playing screen for Music and other media playback is very nice in the car. I also really like having the iPhone user interface available in the car in a way that is optimized for driving. Siri is still Siri so it can take some practice to dictate a command or message correctly, but overall using Siri in CarPlay mode is safer and more efficient. Although CarPlay was announced as iOS in the Car at WWDC 2013 and introduced as CarPlay earlier this year, drivers are only now getting to take CarPlay for a spin which should accelerate the discovery of performance drawbacks and demand for new features. CarPlay as it exists is very useful for a limited set of tasks as you would expect in a car system, and the platform relying on the iPhone for functioning means enhancements are more promising than if third-party vendors had to push new features. Apple says to “stay tuned” for more apps supporting CarPlay, and the platform will greatly improve when the existing set of third-party apps promised gain support, but you may find yourself relying more on non-CarPlay features for now if media playback from those apps is important or features like lane guidance during navigation is a must. For iPhone users eager to test drive the CarPlay experience, the benefit and functionality is already there but at a steep cost. CarPlay itself has room to grow and likely will, and for early adopters an aftermarket solution like the one I used from Pioneer is likely the quickest route to accessing CarPlay.